Jafza International has retooled its Phase 1 development plan for the massive logistics and warehousing complex the company has proposed for rural Santee. Jafza is currently marketing four separate parcels of land on the outskirts of its 1,300-acre property. 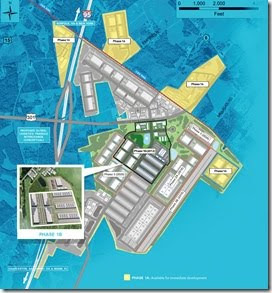 The plots highlighted in yellow on this map are available immediately for light manufacturing, warehousing and logistics space.